Kickers is a beloved heritage brand that has been producing laidback, fashionable footwear for more than 40 years. 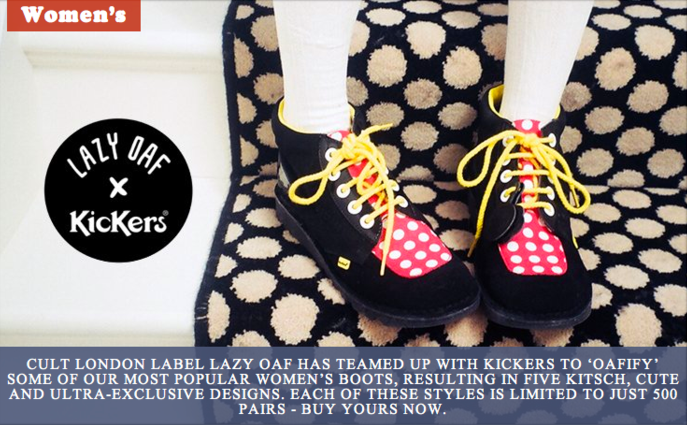 Lazy Oaf is a young and vibrant London-based label with an eye for a playful design and statement screen-prints. When the two brands collaborated on a capsule collection of five fun and fabulous women’s boots they engaged Speak Media to provide onsite copy, product descriptions and additional content. With two such distinctive brands working together we knew that the narrative running through the collaboration had to be fun and fresh, so we followed our editorial instincts and went out in search of the story. We went to Lazy Oaf’s Spring/Summer launch party to get the lowdown on the collaboration and spoke with Gemma Shiel, the creative force behind the London label. Our conversation with Gemma, and her insights into the brand, coupled with our in-depth experience of working with Kickers on several other projects, gave us a wealth of material to inform the copy we produced, breathing life into onsite captions and product descriptions, while also providing the backbone of our post for the Kickers.co.uk blog.